In the beginning, nobody (except Jules Verne) thought anybody would be travelling to space and back in ballistic cannon balls. The only proper way for a space voyager to return to earth was at the controls of a real winged airplane. Tsien Spaceplane 1949 American winged rocketplane. In 1949 Tsien Hsue-shen, the leading expert in high-speed aerodynamics working in America, applied the knowledge learned from German rocket developments to the design of a practical intercontinental rocket transport. Winged Titan American winged orbital launch vehicle. The only trace of this winged version of the Titan launch vehicle are some drawings in popular magazines ca. 1960. Douglas Astro American winged orbital launch vehicle. The Douglas "Astro" was a VTHL TSTO system designed for launching space station crews and cargo by the 1968-70 period. A key requirement was that off-the-shelf technologies must be used, e.g. existing M-1, J-2 and RL-10 engines from the Saturn and Nova expendable launch vehicle programs. Martin Astrorocket Martin winged orbital launch vehicle design of 1962. Early two-stage-to-orbit shuttle study, using storable propellants, Dynasoar-configuration delta wing orbiter and booster. RBSS American winged orbital launch vehicle. The Recoverable Booster Space System was a plan circulated in the early 1960's to use the XB-70 as a recoverable supersonic first stage for a range of systems. The XB-70 would be capable of orbiting a 6800 kg payload, or an X-20 manned space glider. Spiral 50-50 Russian winged orbital launch vehicle. The Soviet Air Force had an enduring interest in a horizontal takeoff/horizontal landing, manned, reusable space launch system that could ferry crews and priority supplies between earth and space on the same basis as conventional aircraft. Between 1960 and 1976 Mikoyan developed this manned partially reusable space launch system. It consisted of a reusable hypersonic air-breathing booster; two expendable rocket stages; and the reusable Spiral manned spaceplane. The effort was never properly funded by the government, and by the mid-1970's had only reached the stage of flight tests of subscale versions of Spiral. Development was discontinued in 1976 in favor of the Buran, a copy of the US space shuttle. However it was resurrected in improved form in the 1980's as the MAKS spaceplane. Astro launch vehicle American winged orbital launch vehicle. Douglas design of the early 1960's for a two-stage-to-orbit, winged, recoverable vehicle. Two versions were envisioned - a preliminary one the size of a DC-8 and a monster vehicle capable of delivering one million pounds payload to orbit. It was assumed at this scale that LOx/LH2 vehicles could achieve stage propellant mass fractions of 88% to 86%. CNES Shuttle 1963 French studies in the 1960's were supervised by the French Space Agency, CNES, and developed along two paths. Path 1 was a manned hypersonic booster stage, with upper stages coming in manned or unmanned variants according to the mission. Path 2 was more conservative, with either the Path 1 booster or an expendable booster launching a small re-entry vehicle - a 'Space Taxi'. NAA RTTOCV NASA awarded a "Reusable Ten Ton Orbital Carrier Vehicle" contract worth $342,000 to North American Aviation. The final concept from 1963 was quite similar to Lockheed's System III design. The launch capability was 11,340 kg (25,000 lb) and the standard payload would have consisted of a small lenticular 12-man orbital transfer vehicle spaceplane for space station logistics and crew transfer. RAE TSTO British winged orbital launch vehicle. The Royal Aircraft Establishment Two Stage To Orbit (TSTO) Concept of the 1960's consisted of a hypersonic air-breathing first stage and rocket powered second stage. Recoverable Booster Systems for Orbital Logistics American winged orbital launch vehicle. Lockheed investigated the economics of reusable launch vehicles for crews and light space station cargo during the early 1960s. Anticipated manned space activities in the 1970s included a two-phase Earth-orbital space station program, a lunar base, an early Mars mission, plus later Mars/Venus missions. Lockheed proposed four possible launch systems to support the scenario, ranging from System I, a 6-man Apollo CSM/Saturn-IB vehicle, to a fully reusable System IV with a ramjet-rocket booster. Aerospaceplane American winged orbital launch vehicle. Development project from 1958-1963 for a horizontal takeoff / horizontal landing, single-stage-to-orbit vehicle that would carry three crew and additional payload from any airfield to orbit and back. Abandoned and replaced by AACB studies for less-ambitious alternatives. Reusable Orbital Carrier American sled-launched winged orbital launch vehicle. The Reusable Orbital Carrier (ROC) was a 1964 Lockheed study of a sled-launched HTHL TSTO. The booster's rocket engines would burn liquid oxygen and jet fuel while small turbojets would be used for landing approach. The 2nd stage orbiter rocketplane would make an unpowered glide return and landing. LOX, LH2 rocket propulsion would be used on the second stage. The gross liftoff weight would be about 453t and the vehicle could deliver ten passengers+3000kg to a space station. Alternatively, an unmanned 11,340kg payload could be carried. Mustard The British Aircraft Corporation "Multi-Unit Space Transport And Recovery Device" design of 1964-1965 was a winged two-stage-to-orbit reusable space shuttle using the 'triamese' concept. The three components of the design were lifting bodies with a configuration similar to the American HL-10 vehicle. BAC sought to reduce development cost by use of two boosters nearly identical to the orbiter vehicle. RAE Orbital Fighter British winged orbital launch vehicle. The Royal Aircraft Establishment Orbital Fighter proposal of the 1960's envisioned a two-stage single-crew vehicle. AACB Class 1 American winged orbital launch vehicle. In 1965-1966 NASA and the Department of Defense jointly studied two-stage-to-orbit reusable launch vehicles as a follow-on to existing expendable launchers. Following review of the three classes of alternative approaches, it was recommended that the immediate goal of the United States should be development of a partially reusable 'Class I' launch vehicle, which could be available by 1975 and would be competitive with existing expendable boosters. A fully reusable vehicle should only be pursued at a later date. Starclipper American winged orbital launch vehicle. Lockheed ILRV design created for the USAF in 1966. X-24B lifting body configuration orbiter with linear aerospike engine and wrap-around drop tank. Related to Lockheed Shuttle LS200 proposal. Space Shuttle American winged orbital launch vehicle. The version of the space shuttle that went into production. Redesign of the shuttle with reliability in mind after the Challenger disaster reduced maximum payload to low earth orbit from 27,850 kg to 24,400 kg. AACB Class 2 American winged orbital launch vehicle. The AACB Class II launch vehicle was a fully reusable, two-stage-to-orbit launch vehicle. Both stages would be lifting bodies and be powered by LOx/LH2 engines. The system would be operational by 1978 and place 9,100 kg of payload in orbit. AACB Class 3 American winged orbital launch vehicle. The AACB Class III launch vehicle was an advanced concept use air-breathing stages, but still requiring two stages to achieve orbit. The joint NASA/USAF panel concluded that the technology did not yet exist to develop this concept, so it was only regarded as an option by 1982 at the earliest. Spacemaster American winged orbital launch vehicle. Martin-Marietta shuttle Phase A design. X-24B type lifting body orbiter with unique catamaran-configuration booster. Isinglass CIA air-launched, single-crew, rocket-powered high speed manned vehicle project of 1965-1968 that developed basic technologies used in later shuttle and reusable launch vehicle programs. McDonnell-Douglas ILRV American winged orbital launch vehicle. The McDonnell-Douglas ILRV design featured fold-out wings for improved low-speed lift-to-drag ratio during final descent and landing. All of the vehicle's propellants were moved outside the orbiter into two large hydrogen tanks and two smaller oxygen tanks. The original concept was sized for an 11,340kg, 9.44m x 4.57m payload. Starclipper Light American winged orbital launch vehicle. Downsized version of the Starclipper, equipped with conventional bell nozzle engines, released by NASA for public consumption in 1968. Triamese American winged orbital launch vehicle. The General Dynamics proposed an ingenious "Triamese" concept for the US Air Force "Integral Launch & Re-entry Vehicle" program. This system (originally developed in 1965 for a classified USAF SAMSO study) would have utilized three virtually identical reusable booster/orbiter element vehicles rather than develop two different booster and orbiter spaceplanes. General Dynamics estimated that the Triamese only would cost $1-2 billion to develop (=$4.5-9B at 1999 economic conditions) and be operational by 1976. Shuttle FR-3 American winged orbital launch vehicle. General Dynamics shuttle proposal phase A of October 1969. Unwinged flat-bottom configuration booster and orbiter with V butterfly-tails. Shuttle LS A American winged orbital launch vehicle. Lockheed shuttle proposal phase A of December 1969. X-24B lifting body orbiter with delta-wing booster. Shuttle NAR A North American's Phase A shuttle design was completed under contract NAS9-9205 in December 1969. North American had learned that the way to win a NASA design competition was to adhere to the design favored by Max Faget, so they proposed a two-stage-to-orbit vehicle, with both booster and orbiter being of Faget's straight-wing, low cross-range configuration. Shuttle MDC American winged orbital launch vehicle. The McDonnell Douglas Space Shuttle Phase A studies were conducted under contract NAS9-9204. Their baseline Class III vehicle design was completed in November 1969 after 13 alternate configurations had been considered. The two-stage-to-orbit vehicle had a gross mass of 1,550,000 kg and a 11,300 kg payload was accommodated in a 4.6 m x 9.2 m payload bay. Shuttle MDC A Alternate American winged orbital launch vehicle. McDonnell-Douglas shuttle proposal phase A of November 1969. Delta wing first stage and HL-10 lifting body second stage. Shuttle HCR American winged orbital launch vehicle. McDonnell-Douglas/Martin Marietta shuttle high cross-range proposal phase B of December 1970. Swept wing booster, delta wing orbiter. Shuttle LCR American winged orbital launch vehicle. McDonnell-Douglas/Martin Marietta shuttle low cross-range proposal phase B of December 1970. Swept-wing booster, Faget straight wing orbiter. Shuttle DC-3 American winged orbital launch vehicle. Marshall Spaceflight Center shuttle concept of April 1970 using Faget low cross range stub-winged booster and orbiter. Shuttle R134C American winged orbital launch vehicle. Rockwell/General Dynamics shuttle proposal phase B, November 1970. Delta wing high-cross range orbiter and booster. Shuttle R134G American winged orbital launch vehicle. Rockwell/General Dynamics shuttle proposal phase B, November 1970. Straight wing low-cross range orbiter. Shuttle LS200 American winged orbital launch vehicle. Lockheed Skunk Works alternate shuttle proposal of June 1971. X-24B lifting body orbiter with wrap-around external tank. Shuttle H33 American winged orbital launch vehicle. Grumman/Boeing alternate shuttle proposal of July 1971. Shuttle orbiter with drop tanks, delta booster. SERV American VTOVL orbital launch vehicle. Chrysler ballistic single stage to orbit alternate shuttle proposal of June 1971. This was the most detailed design study ever performed on a VTOVL SSTO launch vehicle. The 2,040 metric ton SERV was designed to deliver a 53 metric ton payload to orbit in a capacious 7 m x 18 m payload bay. Saturn Shuttle American orbital launch vehicle. A winged recoverable Saturn IC stage was considered instead of solid rocket boosters after the final shuttle design was selected. Buran launch vehicle Design version of Energia, with the reusable Buran manned spaceplane mounted to the side of the core. Energia Version of the Energia using the core vehicle without the Buran spaceplane. EDIN05 American winged orbital launch vehicle. In February 1976 this version of the shuttle was proposed. A single liquid rocket booster under the external tank would replace the two solid rocket boosters. Vulkan Super heavy-lift version of Energia with six strap-on boosters, and in-line upper stages and payloads. The concept was put on the back burner when Energia / Buran development begun. Boeing SDV American orbital launch vehicle. The Boeing SDV Class I vehicle would lead to the Shuttle-C, using the shuttle aft fuselage with SSME engines to power a cargo canister into orbit. System 49 Russian air-launched winged orbital launch vehicle. Study 1981. System 49 was the design that followed Spiral and preceded MAKS in the Soviet quest for a flexible air-launched manned space launcher. Star-raker American winged orbital launch vehicle. Rockwell International's Star-raker was an enormous 1979 heavy-lift ramjet/rocket horizontal takeoff/horizontal landing single-stage-to-orbit concept capable of atmospheric cruise and powered landing for maximum operational flexibility. IHLLV American orbital launch vehicle. Same concept as Shuttle C. Shuttle orbiter replaced by recoverable pod with shuttle main engines and payload canister. Quick way for US to obtain heavy payload capability and reduce shuttle cost per kg to orbit by 3 X.
HOTOL This single-stage-to-orbit winged horizontal takeoff/horizontal landing launch vehicle concept was powered by the unique Rolls-Royce RB545 air / liquid hydrogen / liquid oxygen rocket engine. HOTOL development was conducted from 1982 to 1986 before the British government withdrew funding. It was superseded by the Interim HOTOL design which sought to reduce development cost through use of existing LOx/LH2 engines. Martin Marietta SDV American orbital launch vehicle. The Martin Marietta Class I SDV would lead to the Shuttle-C, using the shuttle aft fuselage with SSME engines to power a cargo canister into orbit. Copper Canyon American winged orbital launch vehicle. DARPA program of 1984 that proved the technologies and concept for the X-30 National Aerospace Plane concept. Shuttle LRB American winged orbital launch vehicle. Shuttle with Liquid Rocket Boosters in place of Solid Rocket Boosters. MAKS Russian air-launched winged orbital launch vehicle. The MAKS spaceplane was the ultimate development of the air-launched spaceplane studies conducted by NPO Molniya. TAV American winged single-crew rocketplane. USAF program of the 1980's that reached the test hardware stage and was leading to a single-stage-to-orbit, rocket-powered, winged manned vehicle. Halted in favour of the X-30 National Aerospace Plane, and then the similar X-33. STS-2000 SSTO French winged orbital launch vehicle. Single stage to orbit ramjet/rocket mix power horizontal takeoff / horizontal landing study of the 1980's. STS-2000 TSTO French two stage to orbit horizontal takeoff / horizontal landing variant of STS-2000. Ramjet/rocket mixed power first stage. Mach 6 separation of rocket-powered second stage. French study of the 1980's. EARL I German winged orbital launch vehicle. A larger Earl 14 configuration was studied, but the study centered on the Earl 5 / 18 / 7 configurations. The second stage was mounted on top of the booster. Earl 5 and 7 had winged second stages, with payloads to low earth orbit of 5380 kg to 7180 kg. Earl 14 featured an expendable upper stage which increased payload to 18,000 kg. Groza Variant of the Energia launch vehicle with two strap-on boosters instead of four. This would have fulfilled the 50 metric ton payload requirement had the third generation booster plan been fully implemented. Chang Cheng 1 Chinese winged orbital launch vehicle. The Chang Cheng 1 (Great Wall 1) vertical takeoff / horizontal landing two-stage space shuttle was a compromise design created jointly by Shanghai Astronautics Bureau 805 (now the Shanghai Academy of Spaceflight Technology) and Institute 604 of the Air Ministry in 1988. An expendable booster, consisting of three of Shanghai's planned liquid oxygen/kerosene modular boosters, would boost the winged second stage shuttle to a high altitude. The engines of the winged shuttle stage would take it to orbit. This approach would allow a first flight to be made in 2008. H-2 HTOHL The H-2 horizontal takeoff / horizontal landing two-stage reusable space shuttle was proposed by Institute 601 of the Air Ministry in 1988. The first stage would used air breathing engines to accelerate the rocket-powered second stage to release velocity. This ambitious design would leapfrog China ahead of other spacefaring nations, but would be available no earlier than 2015. It was decided the concept was beyond Chinese technical capability, and it was not pursued further. V-2 VTOHL Chinese winged orbital launch vehicle. The V-2 vertical takeoff / horizontal landing two-stage reusable space shuttle was proposed by Beijing Department 11 of the Air Ministry in 1988. The first stage would use liquid oxygen/kerosene engines, while the second would use liquid oxygen/hydrogen engines. Both stages would be winged, and first flight would be no earlier than 2015. EARL German winged orbital launch vehicle. Vertical takeoff / horizontal landing two-stage launch vehicle study from the 1980s. MAKS-M Russian winged orbital launch vehicle. Fully reusable unpiloted version of MAKS, similar to Interim HOTOL. Air launched from An-225. MAKS was found to have superior payload, lower non-recurring cost and technical risk. MAKS-M would require new materials. Release conditions: Piggy-back, 275,000 kg, 38.0 m length x 24.0 m wingspan, 900 kph at 9,500 m altitude. Effective velocity gain compared to vertical launch 270 m/s. Payload bay 7.0 m long x 4.6 m diameter. MAKS-T Russian winged orbital launch vehicle. All cargo version of MAKS. Air-launched heavy-lift launcher would use an expendable second stage with a payload container. Release conditions: Piggy-back, 275,000 kg, 38.0 m length x 24.0 m wingspan, 900 kph at 9,500 m altitude. Effective velocity gain compared to vertical launch 270 m/s. Payload bay 13.0 m long x 5.0 m diameter. Shuttle II American orbital launch vehicle. In May 1988 NASA Langley studied a new-technology approach to improving the shuttle's payload capability. The design would allow 9,000 to 18,000 kg of additional payload to be carried in an external payload container or in the orbiter. VKS-D Russian winged orbital launch vehicle. Air launched from An-225. Release conditions: Piggy-back, 275,000 kg, 38.0 m length x 24.0 m wingspan, 900 kph at 9,500 m altitude. Effective velocity gain compared to vertical launch 270 m/s. VKS-RTO+ZhRD Russian winged orbital launch vehicle. Horizontal takeoff, delta winged, single-stage-to-orbit, launch vehicle. Mixed rocket / ramjet propulsion. VKS-ZhRD+GPVRD Russian winged orbital launch vehicle. Horizontal takeoff, delta winged, single-stage-to-orbit, launch vehicle. Mixed rocket / scramjet propulsion. VKS-G Russian winged orbital launch vehicle. Air launched from Kholod Mach 5 mother ship. This was a Mikoyan supersonic cargo aircraft, designed from Spiral 50-50 design. Combined-cycle turbo-ramjet engine. Release conditions: Piggy-back, 200,000 kg, Mach 5 at 25 to 30 km altitude. Effective velocity gain compared to vertical launch 1130 m/s. It was concluded that the extensive development would be required for the combination-cycle engines, resulting in an extended development schedule and high technical risk. The more conservative subsonic-launched MAKS was chosen instead. VKS-O Russian winged orbital launch vehicle. Vertical takeoff, ballistic re-entry, single-stage-to-orbit, LOx/Kerosene/LH2 tripropellant rocket engine powered, reusable launch vehicle. 550 metric ton and 770 metric ton gross lift-off mass versions considered. VKS-R Russian winged orbital launch vehicle. Sled launched, delta winged, single-stage-to-orbit, LOx/LH2 launch vehicle. 290 metric ton and 550 metric ton versions considered. Studied in tradeoff studies leading to MAKS. Release conditions: Piggy-back, 290,000 kg, Mach 0.5, zero altitude. Effective velocity gain compared to vertical launch 100 m/s. The wheeled sled would get the vehicle up to a velocity where the wings could provide lift, allowing lower-thrust engines to be used than in a vertical-takeoff design. This saved weight, but velocity losses during lifting flight to orbit almost cancelled the advantage, resulting in the approach being unattractive in comparison to pure vertical-launch or air-launch designs. VKS-V Russian winged orbital launch vehicle. Vertical takeoff, delta winged, single-stage-to-orbit, LOx/Kerosene/LH2 tripropellant rocket engine powered vehicle. 550 metric ton gross liftoff mass and 1000 metric ton versions studied. Analogous to NASA's Shuttle-2 and RKK Energia's VKS. Mikoyan 301 Russian intermediate range cruise missile. The 301 was designed as a military bomber, with a Mach 4 / 4,250 km/hr cruise capability at 25,000 to 27,000 m altitude. It was equipped with two turboramjets, had a gross takeoff mass of 80 metric tons, of which half was fuel. It may be related to the first stage of the MIGAKS two-stage vehicle. Buran-T Fully recoverable version of Energia launch vehicle, with four winged boosters and a winged core stage. Shuttle LRB 1989 American orbital launch vehicle. In July 1989 a NASA Langley/George Washington University joint study was made of various Liquid Rocket Booster configurations. Shuttle C American orbital launch vehicle. NASA Marshall design for a cargo version of the shuttle system. The shuttle orbiter would be replaced by an unmanned recoverable main engine pod. The same concept was studied earlier as the Interim Heavy Lift Launch Vehicle (IHLLV) and as the Class I Shuttle Derived Vehicle (SDV). The Phase I two-SSME configuration would have a payload of 45,000 kg to low earth orbit. Design carried to an advanced phase in 1987-1990, but then abandoned when it was found the concept had no cost advantage over existing expendable launch vehicles. DSL HTHL German winged orbital launch vehicle. Under the Future European Space Transportation Investigation Programme (FESTIP) of 1994-1999 French agencies and contractors designed a number of alternative reusable space launchers. This one was a Horizontal Takeoff / Horizontal Landing Two Stage to Orbit proposal with Mach 3 stage separation. Later evolved into the FESTIP FSS-11,which was merged with FSS-12. Reusable and expendable upper stage options. Oriflamme French design for a scramjet-powered horizontal takeoff / horizontal landing, single stage to orbit vehicle. Radiance French winged orbital launch vehicle. Two stage to orbit horizontal takeoff / horizontal landing vehicle. Booster would be powered by scramjets to Mach 12 separation before second stage separated. RWDT HTHL German winged orbital launch vehicle. Under the Future European Space Transportation Investigation Programme (FESTIP) of 1994-1999 French agencies and contractors designed a number of alternative reusable space launchers. This one was a Horizontal Takeoff / Horizontal Landing Two Stage to Orbit proposal with Mach 4 stage separation. Vehicle consisted of an unpowered 'reusable winged drop tank' and 2-engine expendable Ariane-5 upper stage. Spacecab The Two Stage To Orbit (TSTO) Concorde-sized Spacecab would deliver a payload of six persons to low Earth orbit. It would serve as a prototype for the larger 50-person Spacebus. STAR-H French winged orbital launch vehicle. Mach 6 hypersonic first stage would launch Hermes spaceplane with an expendable second stage. TARANIS French study of vertical takeoff / horizontal landing, two stage to orbit launch vehicle with expendable orbiter fuel tanks. EARL II German winged orbital launch vehicle. Later EARL version from 1990. Parallel staging, both stages winged and recoverable. Expendable upper stage for heavy-lift missions. Low Cost Cargo Vehicle American orbital launch vehicle. This variant of the Shuttle C was envisioned for delivery of liquid hydrogen and liquid oxygen to orbit. Shuttle C Block II American orbital launch vehicle. In August 1989 NASA studied a version of the Shuttle-C with two Advanced Solid Rocket Motors (ASRM's) in place of the standard RSRM's. This would increase the payload by 4500 kg, but also require use of a new 10 m x 30 m payload module. Spacebus British winged orbital launch vehicle. The Bristol Spaceplanes Spacebus was a Two Stage To Orbit (TSTO) Manned Spaceplane designed to take 50 passengers into space. Shuttle Z American orbital launch vehicle. Shuttle-Z was Shuttle-C on steroids, the ultimate development of the shuttle to be used to put Mars expeditions into orbit. It would use 4 SSME's, and a third stage with 181,000 kg of propellant powered by 1 SSSME. But such designs would require new handling facilities due to the extra height of the vehicle. Interim HOTOL Initiated by a British Aerospace team led by Dr Bob Parkinson in 1991, this was a less ambitious, scaled-back version of the original HOTOL. The single-stage to orbit winged launch vehicle using four Russian rocket engines. It was to have been air-launched from a Ukrainian An-225 Mriya (Dream) aircraft. Interim HOTOL would separate from the carrier aircraft at subsonic speeds, and would then pull up for the ascent to orbit. It would return via a gliding re-entry and landing on gear on a conventional runway. Interim HOTOL suffered from the same aerodynamic design challenges as HOTOL and went through many, many design iterations in the quest for a practical design. Ares Mars Direct American orbital launch vehicle. The Ares launch vehicle was designed for support of Zubrin's Mars Direct expedition. It was a shuttle-derived design taking maximum advantage of existing hardware. It would use shuttle Advanced Solid Rocket Boosters, a modified shuttle external tank for handling vertically-mounted payloads, and a new LOx/LH2 third stage for trans-Mars or trans-lunar injection of the payload. Ares would put 121 metric tons into a 300 km circular orbit , boost 59 metric tons toward the moon or 47 metric tons toward Mars. Without the upper stage 75 metric tons could be placed in low earth orbit. VKS-DM Russian winged orbital launch vehicle. Air launched from Gerakl / NPO Molniya-1000 heavy-lift aircraft, catamaran layout, twin-fuselage triplane. Release conditions: Suspended load, 450,000 kg, 900 kph at 9,500 m altitude. Effective velocity gain compared to vertical launch 270 m/s. Burlak Russian air-launched winged orbital launch vehicle. Burlak air-launched satellite launcher was proposed in 1992 and studied by Germany in 1992-1994. Evidently based on secret anti-satellite missile. Air launched from Tu-160 bomber, released at 13,500 m altitude and Mach 1.7. Development estimated to cost only DM 50 million, but not proceeded with. Burlak/Diana variant would have been launched from Concorde. 17K-AM A small two stage to orbit horizontal takeoff / horizontal landing vehicle proposed for the Russian Air Force in 1993. Ajax Russian sled-launched winged orbital launch vehicle. Sled-launched, air-breathing, single stage to orbit, horizontal takeoff / horizontal landing launch vehicle proposed in Russia. ASA Russian sled-launched winged orbital launch vehicle. Sled-launched airbreathing single stage to orbit horizontal takeoff / horizontal landing launch vehicle proposed in Russia. Herakles Russian air-launched winged orbital launch vehicle. Launch vehicle design by NPO Molniya / TsAGI that would utilize air launch from a giant cargo aircraft capable of lifting 900 metric ton payloads. The single stage to orbit spaceplane would be released at subsonic velocity. MiG-2000 Russian sled-launched winged orbital launch vehicle. Sled-launched single stage to orbit vehicle with air-breathing propulsion to Mach 5 (subsonic combustion). The sled would accelerate the launch vehicle to Mach 0.8. Propellants were slush hydrogen and liquid oxygen. The vehicle would have a 3000 km cross-range on re-entry. MIGAKS Russian winged orbital launch vehicle. Turbojet/ramjet-powered two stage to orbit horizontal takeoff / horizontal landing vehicle. Mach 6 stage separation. The orbiter had a 2000 km cross-range capability with landing on airfields with runways of 3500 m length or more. MAKS-D Russian winged orbital launch vehicle. NPO Molniya, Antonov, and TsAGI proposed a spaceplane demonstrator project to the European Space Agency in 1993-1994 under the RADEM project. This would be a scaled-back version of the cancelled MAKS spaceplane using existing rocket engines. An unmanned prototype of the MAKS would be fitted out with RD-120 LOx/Kerosene engines. 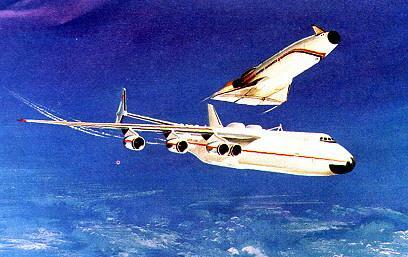 Launched from atop the An-225, the MAKS-D would reach an altitude of 80 to 90 km and a speed of Mach 14 to 15. Shuttle ASRM American winged orbital launch vehicle. Shuttle using Advanced Solid Rocket Motors (development cancelled 1993). Energia M Launch vehicle originally designed in the 1980's to fulfill the third generation 20-30 metric tons to orbit launcher requirement. It was an adaptation of the Energia launch vehicle, using two strap-on booster units instead of four, and a reduced-diameter core using a single RD-0120 engine instead of four. In the 1990's a structural test article was built and it was proposed that several Energia-M's be launched for commercial customers using surplus Energia components. No buyers came forward for the untested design. Skylon British single-stage-to-orbit, horizontal-takeoff-horizontal-landing turborocket orbital launch vehicle design of the mid-1990's. The novel lightweight structural design was based on lessons learned in the many iterations of the HOTOL concept. The classified Sabre turbojet-rocket combined-cycle engine was taken to a high level of test by Alan Bond at Rolls Royce. Despite the extreme promise of the design, neither British government or private financing was forthcoming. Nevertheless design improvement and component test was still continuing 20 years later. Shuttle ISS American winged orbital launch vehicle. Redesign of the shuttle with reliability in mind after the Challenger disaster reduced maximum payload to low earth orbit from 27,850 kg to 24,400 kg. When the decision was made to move the International Space Station to a high-inclination 51.6 degree orbit, net payload to the more challenging orbit dropped to unacceptable limits. The situation was improved by introduction of the Super Lightweight External Tank, which used 2195 Aluminum-Lithium alloy as the main structural material in place of the 2219 aluminum alloy of the original design. This saved 3,500 kg in empty mass, increasing shuttle payload by the same amount. The tank was first used on STS-91 in June 1998. Orel In the late 1990's the Russian space industry undertook the Orel program to evaluate technology for future launch vehicles. The goals included evaluation of possible concepts for a future Russian launcher, reusable launch vehicle key technology research and analysis of "X-vehicle" flight demonstrators for technology validation. Orel V2 Russian winged orbital launch vehicle. This preferred near-term configuration was a semi-reusable vertical takeoff/horizontal landing two stage launch vehicle. It would use a flyback booster, expendable second stage, and a small manned spaceplane. This was preferred to the Orel V3, which was essentially the earlier MMKS/OK-M1 system with a flyback booster, expendable core tank, and small spaceplane with recoverable main engines. Orel V7 RSSLV-2 Russian VTOVL orbital launch vehicle. Fully reusable vertical takeoff / vertical landing single stage to orbit. Concept abandoned in favor of Orel V6 by 1998 due to engine reliability concerns. Version with LOx/LH2 propellants. Orel V7 RSSLV-3 Russian VTOVL orbital launch vehicle. Fully reusable vertical takeoff / vertical landing single stage to orbit. Concept abandoned in favor of Orel V6 by 1998 due to engine reliability concerns. Tripropellant LOx/Kerosene (RG-1)/LH2 version. Orel V4 Russian winged orbital launch vehicle. Fully reusable vertical takeoff, horizontal landing two stage to orbit concept. Abandoned in favor of Orel V6. Orel V5 Russian winged orbital launch vehicle. Vertically launched two stage to orbit concept consisting of horizontal landing booster, vertical landing orbiter. Abandoned in favor of Orel V6. Orel V6 Fully reusable vertical takeoff / horizontal landing single stage to orbit launch vehicle. The preferred long-term alternative of the Russian Orel launch vehicle study of the 1990's. Norma Russian winged orbital launch vehicle. Semi-reusable vertically launched two-stage-to-orbit vehicle. The flight profile featured a reusable flyback booster launched from a modular launch platform, an expendable second stage with a reusable orbiter that would have landed vertically. Development cost estimated at $13 billion. Themis launch vehicle French winged orbital launch vehicle. Themis was a planned ESA booster stage demonstrator, to validate integrated propellant tank technology necessary for a reusable Ariane 5 successor. The demonstrator engine would be derived from the Vulcain of the Ariane 5. Estimated cost was up to 2.5 billion dollars. THEMIS would carry 33 metric tons of propellant, enough to reach Mach 11. Expendable boosters might permit orbital flight. EXTV French winged orbital launch vehicle. This was to be a reusable winged rocket-powered atmospheric reentry demonstrator capable of reaching speeds of Mach 4 to 10 in the atmosphere. The aim was for ESA to build up experience in reuse operations and high-speed atmospheric flight in the 2003-2007 period. The demonstrator would weigh two metric tons and have a range of 1500 kilometers. It would be able to land on a conventional runway. Dassault and Aerospatiale Matra were to merge their VEHRA and ARES projects to produce a single design. Ares estimated cost was 550 million dollars. FLTP/FESTIP European winged orbital launch vehicle. Europe's Future Launcher Technology Program (FLTP) was an ESA study program that ran from 1999-2002, with the objective of identifying and developing technologies necessary for the successor to the Ariane 5. The planned configuration was a two-stage fully recoverable winged launch vehicle. The winged booster would deliver the orbiter to a given altitude, then booster fly back to its launch base at Kourou. The second stage orbiter continued to orbit, delivered its payload and then returned to Kourou. The program faded out following collapse of the commercial launch market, development problems with the Ariane 5, and cancellation of NASA reusable launch vehicle projects. Under the Future European Space Transportation Investigation Programme (FESTIP) of 1994-1999 French agencies and contractors designed a number of alternative reusable space launchers. X-33 American winged rocketplane. NASA-sponsored suborbital unmanned prototype for a single-stage-to-orbit rocketplane. The Lockheed Martin vehicle would have used a linear aerospike engine, metallic insulation, and other features similar to their Starclipper shuttle proposal of 1971. In 1999 catastrophic failure of the composite fuel tank during static test brought into question the technical feasibility of the design. The program was cancelled in 2001 before any flight articles were completed and after over $1.2 billion had been expended. Tier One Burt Rutan's Tier One was the second manned reusable suborbital launch system (after the B-52/X-15). But it was developed privately at a small fraction of the cost, and won the X-Prize in 2004 as the first privately-developed reusable manned suborbital spacecraft. The design was greatly enlarged to produce SpaceShipTwo, the first commercial spaceplane. Pathfinder Pioneer Rocketplane two-crew single-stage-to-orbit aerial-refueled spaceplane design of 2003. It elaborated on the Black Horse and Black Colt concepts of the 1990's. Ares FBB American winged orbital launch vehicle. The ARES ((Affordable REsponsive Spacelift) concept was of a reusable fly-back booster with expendable upper stages. The US Air Force began development of a demonstrator in May 2005, with a first flight date of 2010. It was felt that derivatives of the concept could support all space lift requirements of the USAF. Gryphon American winged orbital launch vehicle. Winged, horizontal-takeoff/horizontal concept space booster concept using an Air Collection and Enrichment System to generate liquid oxygen oxidizer from the atmosphere after takeoff. An upper rocket stage would deliver a crewed orbiter or payload to orbit. Spacecraft: Lockheed RTTOCV, Albatros, MVKS, Yakovlev MVKS, Ascender, Hytex.